The perfect option for those without medical insurance. Our Community Care Program is available to residents of Virginia only. It is ideal if you don’t have medical insurance because it provides our patients with discounts on their healthcare needs. The annual fee is only $25 per year, and you’ll receive discounts on a number of different services. Learn more below or feel free to contact us today with any questions. Click here to learn more about the insurance plans we accept. If you or your family don’t have medical insurance, we invite you to join the Medics USA Community Care Program. The program gives deep discounts to individuals who cover the cost of their own healthcare. Community Care will be honored at all of our Virginia locations. The program is only available to those residents of Virginia without health insurance. All labs and any blood work will also be discounted and may be billed directly from the lab. 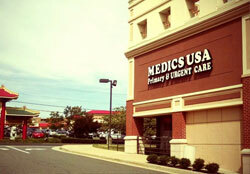 Ask about the Medics USA Community Care Program at any of our Virginia offices.